If your visit to Grenada is scheduled between March and June, then you could be lucky enough to witness the spectacle of the leatherback turtles visiting the island. The leatherback turtle is the largest of the sea turtle family. At up to 6 foot long and weighing up to 2000 lbs, witnesses cannot fail to be astounded by the size and the presence of this giant marine reptile. Leatherback turtles travel up to 10,000 miles per year as they traverse the world’s oceans seeking food, mates and their egg laying beach – the very same beach that they were born on several years before. Yes, nature really is that amazing! Their shell is soft as leather and is quite unique in that it does not have plates as you might expect to see on other turtle species and even tortoises. One of the main nesting beaches for leatherback turtle watching in Grenada is Levera Beach – which is just 15 minutes away from us here in Sauteurs. During turtle nesting season, it is a prohibited area and permission is required for the purpose of turtle viewing. We can apply for you and we can book you into an organised tour where you will be accompanied by experts. Your guides will share all that they know about the leatherback turtle with you including their experiences with previous turtle visits and encounters. The turtles are monitored every year to record which ones have returned to the beach that they were born on. The turtle stewards record each visit and will tag the turtles with a microchip in order to be able to identify each turtle and understand what it’s activities have been since the turtle was last seen. What can you expect from this activity? You can enjoy a close encounter with the world’s fourth largest reptile (after 3 crocodilians). Your visit will commence at the Levera Beach Information Centre at Bathway Beach. 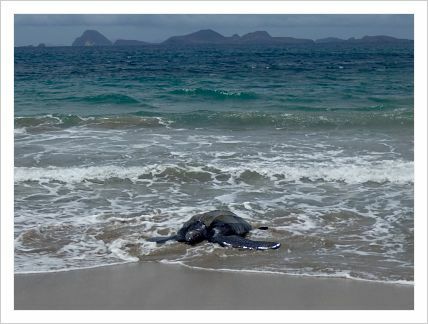 You will be introduced to the world of the leatherback turtle and what the local organisation (SPECTO) St Patrick’s Eco-Conservation Tourism Organisation are doing to protect the species. Then you will be accompanied down to Levera Beach with a guide who will take you to the turtles once they are ready to receive viewers. You can then watch the turtles dig their nests in the sand as other turtles may appear at the shoreline ready to lay their eggs. The turtles will then lay up to 120 eggs each and will cover the nest with sand for the eggs to mature for hatching. After 50-70 days the eggs will begin to hatch. When the eggs hatch, hundreds of baby turtles of just 4-6 inches long will cross the beach looking for the shoreline. Each baby turtle is a miniature of their huge and fascinating parents. The mothers will return to lay eggs on average between 3 and 6 times each season. It’s not every season that the mother will mate, so she might not return for 2-3 years. The gender of the turtle is not decided during conception but by the temperature of the sand in which the egg is laid. At the centre of the nest the sand is often the warmest, so that’s where many female turtles develop. Leatherback turtles typically lay infertile eggs last so they can act as a barrier to protect the other eggs. The turtle stewards from both Specto and from Ocean Spirits will leave the turtle babies to find their own way to the sea, as they will need to remember the beach in order for them to return at maturity to lay their own eggs. Only one of every one thousand babies reach adulthood and return to the beach to lay their own eggs. If you would like us to book your once in a lifetime experience of an encounter with the leatherback turtles or even if you’d just like to know more, please get in touch. The turtle tour is just US$20. Ocean Spirits is a non-profit with a focus on protecting the sea turtles that visit Grenada. They perform scientific research and provide a nationwide education on sea turtles for the communities of Grenada. To find out more about Ocean Spirits visit their website. Contact us if you want to know more about turtle watching in Grenada during your stay at Petite Anse Hotel.